If you’ve never opened up a computer case in your life then you can pretty much just ignore this post. I had been running an old WD 250gb SATA HD and an even older Seagate 200gb IDE HD and was starting to run out of room. WD and Seagate both recently came out with new 640gb drives containing two 320gb platters and I picked up the WD drive from Newegg. The higher density means these drives really move and the quick comparison I did with my old WD shows the new one to be almost twice as fast. Reads come in at 110MB/s and the old drive would average out at about 60MB/s. So far Windows seem a lot snappier with the new drive. One thing that surprised me was the old WD was idling 10°C higher than the new drive so it’s even cooler on top of being faster. I also replaced my burner with a Samsung SATA drive, finally eliminating IDE from my computer. This let me really clean up my cabling. My old Thermaltake PSU that has served me well for the past 4 years only had 2 SATA power connectors so I replaced it with a new Corsair 450w PSU I had picked up on eBay from a seller who didn’t know what he had ($70 PSU for about $25, nice). I also put in an Audigy 2 ZS sound card I got from Creative on clearance for $20. Great card, less noise than the onboard and the mic input seems to handle my headset mic better. SERIOUSLY WHAT THE HELL! Thankfully only a handful of programs were developed by morons who thought this modification to the standard Windows experience was a good idea. One principle I follow when I do user interface design is don’t make the user think. 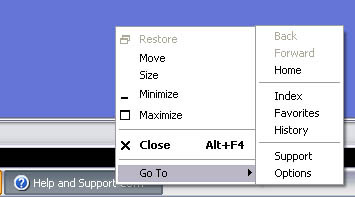 With this right-click scenario I instinctly click the first option to close. When it doesn’t close the program I have to stop what I’m doing and figure out why my computer decided to do something different than I intended. Sorry for the rant, but these flaws are the kind of things I try to avoid in my own applications and have become more aware of. I have a lull in stuff to do at work and I looked at my keyboard and realized that it is quite an outdated and unfriendly piece of equipment. A line from Atom and His Package’s song on the metric system comes to mind, ” You’re drunk with your tradition / That has no validity”. Ever wonder what the scroll lock key really does (was used to allow scrolling text around the then small screens with the arrow keys)? Ever actually used it for anything? Me neither. So why is it still being placed on our keyboard even though it hasn’t been used since the 1980’s. Most things we use are engineered for a particular use, the shifter in your car is made just to shift and P, R, N, and D all make pretty good sense. The keyboard sitting in front of you though doesn’t make sense because it is meant as a general purpose input device and this leads to a boatload of problems. In Microsoft Word, know what the F7 button does? It brings up the spellchecker. The only way you would know that is if you have it memorized, not because it makes sense to associate function key 7 with checking your spelling. Any guesses on what the other function keys do? The shift key is another marvel all in itself, with the addition of one key the number of available functions available on a keyboard double! So in Word, when you hit shift+F7, it no longer brings up the spellchecker, this time you get the thesaurus. In some programs like Photoshop, I’ve seen some functions being tied to triple and quadruple key presses, good for people highly proficient in the program, bad for people trying to learn it. Some keyboard functions have become standardized simply because of the location of the keys themselves! Ctrl+X cuts text and places it memory, Ctrl+V inserts that text wherever the curser is on the screen, and Ctrl+Z undos the process. There is no real meaning tied to the Z, X, and V keys, they just happen to be the easiest to press while holding down the left Ctrl key with your pinky. I feel sorry for people without a left pinky because it would make copying and pasting a pain. So what’s the problem? This abstract relationship between buttons and functions is not user friendly. The longer things stay the same the more people get locked into it and that makes changing things even harder. I think our biggest hope for change lies with laptops and smaller form factor devices that don’t have the real estate luxury for extraneous buttons. Have you had any problems with your keyboard or experienced difficulty figuring out what keys actually do what?